Illustrates the original site of Columbia College, now Columbia University. 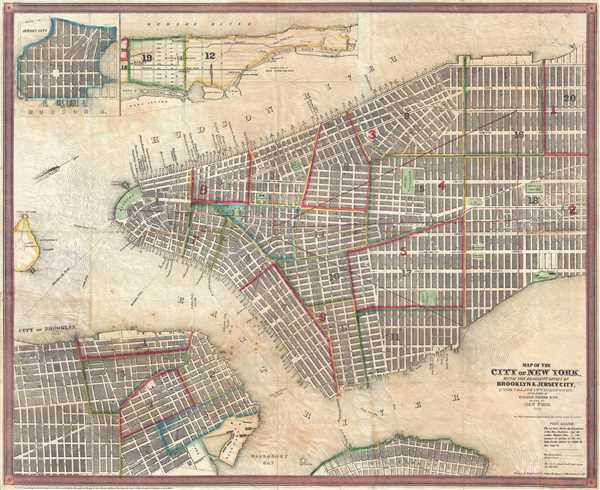 Map of the City of New York, with the Adjacent Cities of Brooklyn and Jersey City, and the Village of Williamsburg. This is a scarce and beautiful 1850 pocket map of New York City published by Ensign, Thayer and Co. It depicts Manhattan from 32nd Street south to the Battery and Brooklyn from the Navy Yard to Sackett Street as well as part of Williamsburg. A large part of Governors Island is also included. City wards are numbered and coded with outline color. All streets are labeled, the map is gridded in quarter-mile sections and countless important buildings are noted. Ferry routes cross the East and Hudson Rivers in numerous places and are identified. A key is included below the title, which also notes the 'strokes of bell' for fire alarms in the first, second and third districts. The map notes the original site of Columbia College near Park Place. An inset of Jersey City and another large inset of the Northern part of New York Island are featured in the top left corner. Although the northern part of Manhattan was undeveloped at the time, the map clearly depicts the Croton Aqueduct and the Harlem and Hudson Railroads. Bloomingdale Road, the oldest north-south main road in New York which would eventually become Broadway, is also noted. This map was published by Ensign, Thayer and Company of 50 Ann St., N. Y. as a pocket map. Drawn and engraved by John M. Atwood, 19 Beekman St., N.Y. Entered according to act of Congress in the year 1844, by Humphrey Phelps in the Clerks office of the District Court of the Southern District of New York. John M. Atwood (1818 - c. 1880) was an American engraver based in Philadelphia and New York City during the middle part of the 19th century. Atwood was born in Washington D.C. Little is known of Atwood's life but most of his work was completed in conjunction with the publishing firms of Horace Thayer and J. H. Colton. A review of Atwood's work suggests that he was a highly accomplished, stylistically distinct, and detail oriented engraver. Colton seems to have turned to Atwood to engrave some of his most important as well as decorative maps. His most influential map is most likely the 1856 De. Cordova pocket map of Texas, however, he also engraved the Colton's well known and highly decorative Thirty Three Miles Around New York and Colton's important 1849 Map of the United States. Very good. Verso repairs at fold intersections. Light soiling and foxing. Blank on verso. Accompanied by original binder. OCLC: 46396257. New York Public Library, Map Division, Map Div. 01-1820. Haskell, D., Manhattan Maps A Co-operative List, 875 (1852).